A fundamental core of city living is the act of commuting. As Downtown residents we quiver at the feeling of landlocked freeways. We like to think we are a bit wiser when it comes to embracing alternate ways of our navigation from point A to B. You’ll discover distinct forms of commuting in our framework, a quickly growing metro, buses, long boards, and even those awkward one wheel scooters that don’t seem to have any breaks (be careful people). And of course, the classic and all mighty bicycle, in which our new resident tokyobike builds with stylish precision that will have heads turning while you turn corners. 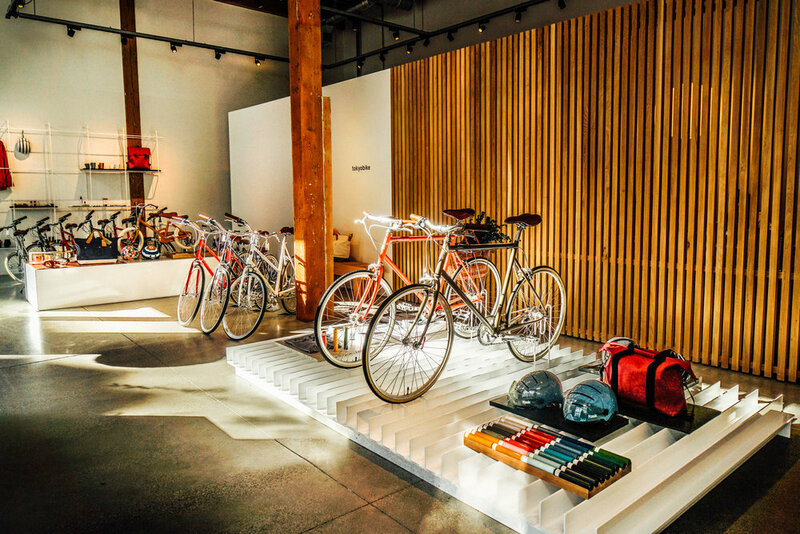 You’ll find the home base of tokyobike at the fast developing ROW off Alameda St. The team packed up from New York City and headed west to relocate their office and showroom here in DTLA. Manager RoseMary Sindt reflected on the big decision, “We aimed to develop further in a city that has bike riding year round, just made so much sense.” If you’re a gear junkie, the sight of these machines is simply stunning. Designed in Tokyo and inspired by fixed gear road bikes, the craftsmanship of the steel frame shines from the spokes to the leather-bound handles. RoseMary echoed the importance of tokyobike’s aesthetic, “Built with the mindset of city commuting, we want it to also look good in your home.” The details go beyond visual stimulation and thrive with functionality. “You’ll notice smaller wheels that make the bike more responsive and make it easier for public transportation.” Built on the concept of “Tokyo Slow” there are different styles ranging from single speed to sport are displayed to compliment different personalities. Safe to say these cycles can handle the elements and offer a selection of well-tailored accessories from baskets, racks, lights and helmets. Truly the ultimate city ride, tokyobike rode in just in time. Designed to explore the places we love most, tokyobike captures the importance of the journey and keeps you sharp while pedaling toward your next adventure.